A conceptual picture of fusion energy inside a tokamak, the doughnut-shaped machine that produces plasma for fusion energy. A new paper has found whistler waves, normally found in the ionosphere, inside a nuclear fusion reactor. Editor's Note: This story was updated at 1:35 p.m. E.T. 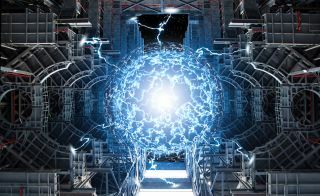 Mysterious, ghostlike "whistler waves" that are normally created by lightning could protect nuclear fusion reactors from runaway electrons, new research suggests. These whistler waves are naturally found high above ground in the ionosphere — a layer of Earth's atmosphere about 50 to 600 miles (80 an1000 kilometers) above the planet's surface. These ghostly whistler waves form when lightning bolts generate pulses of electromagnetic waves that travel between the Northern and Southern hemispheres. These waves change in frequency as they cross the globe, and when these light signals are converted to audio signals, they sound like whistles. Now these whistler waves have been discovered in the hot plasma inside a tokamak — the doughnut-shaped machine where nuclear fusion reactions take place — according to a recent study published April 11 in the journal Physical Review Letters. Because whistlers can scatter and impede high-speed electrons, they could provide a new way to prevent runaway electrons from damaging the inside of a tokamak. In nuclear fusion reactions, which power the sun and stars, atoms slam together, fusing into larger atoms while releasing energy. For decades, researchers have been trying to harness fusion energy on Earth, using powerful magnetic fields inside tokamaks to corral doughnut-shaped clouds of hot plasma — a weird phase of matter that consists of electrically charged gas. Inside the tokamak, electric fields can propel electrons faster and faster. But as these high-speed electrons fly through the plasma, they can't slow down. Normally, objects moving through a gas or liquid feel a drag force that increases with speed. The faster you drive your car, for example, the more wind resistance you run into. But in plasma, drag force decreases with speed, allowing electrons to accelerate to near light speed, damaging the tokamak. Researchers already have a few techniques to mitigate runaways, said Don Spong, a physicist at Oak Ridge National Laboratory in Tennessee and a co-author of the new study. They can use artificial intelligence algorithms to monitor and adjust the density of the plasma to prevent electrons from accelerating too fast. If there are still runaways, they can inject pellets of frozen neon into the plasma, which increases the plasma density and slows runaway electrons. But whistler waves could be yet another way to rein in runaway electrons. "We ideally want to avoid disruptions and runaways," Spong said. "But if they occur, we would like multiple tools available for dealing with them." In the tokamak at the DIII-D National Fusion Facility in San Diego, Spong's research team detected, for the first time, whistler waves being produced by runaway electrons. Plasma, he explained, is like a piece of Jell-O with many modes of vibration. If some runaway electrons have just the right velocity, they excite one of these modes and trigger whistler waves — similar to how driving an old car at just the right speed can cause the dashboard to vibrate. "What we would like to do is reverse engineer that process and put those waves on the outside [of the plasma] to scatter the runaways," Spong said. By better understanding how runaways create whistlers, the researchers hope they can reverse the process — using an external antenna to generate whistlers that can scatter the electrons and prevent them from getting too fast. The researchers still need to further explore the relationship between runaways and whistlers, Spong said, for example, by identifying what frequencies and wavelengths work best to inhibit runaways and by studying what happens in the denser plasma needed for fusion reactors. Of course, suppressing runaway electrons is just one hurdle to creating clean energy from nuclear fusion. Right now, fusion reactors require more energyto heat plasma than is produced by the fusion. To reach the breakeven point, researchers still have to figure out how to get plasma to stay hot without having to add heat. But Spong is optimistic about fusion energy. "I'm a believer that it's achievable." In 2025, the ITER project in southern France is slated to begin experiments. and scientists hope it will be the first fusion machine to produce more energy than is used to heat the plasma. Several groups have set their sights on achieving net positive fusion energy by 2050. And a new collaboration between MIT and a company called Commonwealth Fusion Systems announced that the partners hope to put nuclear fusion on the grid in 15 years. Editor's Note: This story was updated to note that light signals, rather than light frequencies, are converted to audio signals.